The king of the Grand Carrera sports luxury watches. All these wonderful gadgets mean you will be able to time an object moving and estimate it’s speed. You can tell time to the second, and always know the date. The clasp is designed to stay secured in case you accidentally knock it against something. It’s easier to put on than a traditional buckle, and the rubber will not show wear like a leather band. The automatic movement is a must in among luxury sports watch afficionados, and is rooted in Tag Heuer’s history. They have been making automatic Carreras for 40 years. The waterproof guarantee is another indication of this watch’s fine workmanship. The back is nearly as beautiful as the front, with sapphire crystals revealing the inner workings, and screws in the case. Many features like this are part of a perfected design that has made the Carrera popular for many years. But the Grand Carrera Chronograph Automatic CAV518E.FT6016 also wins points in aesthetics, too. The date function seems unnecessary. Of course, these two complaints are a matter of taste. Some men will put on this watch and love the rose gold; it adds a spark of luxury to the otherwise sporty look. Some will opt for one of the other two watches in the Grand Carrera series because they don’t want the gold look. As for your watch telling you the calendar date, it sounds entirely useful and practical to me. But, again, some people don’t use this feature much and would rather not have it. 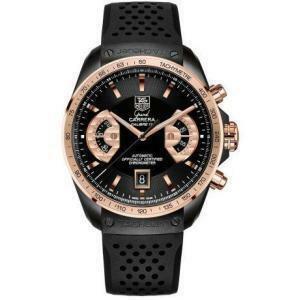 The Tag Heuer Grand Carrera Chronograph Automatic men’s watch CAV518E.FT6016 is truly a masterpiece of fine quality workmanship, rich materials, and beautiful design, and ought to bring a satisfied smile to more than a few men of discerning taste.